Could it be 2.608 ?? Yes Livia dear ! It is 2608 & not 2908 as shown in the last shot you've just posted . This makes sense : 2608 (in 1930) - 1964 (in 1921) = 644 ouds in 10 years. That's 1.3 oud a week (+ -) , taking into consideration 2-3 weeks of annual vacations for Christmas, Easter & some national & or other feasts. Thank you a lot indeed. Numbers are easy to translate hehe The most difficult is to translate the arabescus (draws). I have asked a friend of mine to help me. I Guess Elias' production wasn't so large here in Brazil. May be because he did the job alone (or almost alone) and as a hobby. He produced 100 instruments from 1969 (or 1970) to 1985. It's my pleisure. Thank u a lot and I hope you to keep on helping me! The most difficult is to translate the arabesques (draws) . Thank u a lot and I hope you to keep on helping me ! You bit I will , no problem ! Handwriting & Arabic calligraphy aren't really made in order to be read. They fill in where drawing has been forbidden by the Islam. "work of the late Abdo Nahat's of Damascus's sons in San Paulo Brazil"
Hey, Al Faraby, that's what I told my friend, that may be Elias had written something similar to the label's text. I can understand the words Brasil, Sao Paulo, Abdo Nahat, sons hehehe That's all. The rest? I guessed hehehe Thank u for solving this mistery! Number 35 rosette is even worst to translate. Hope u help me when I upload it! Please, look the 2 new albuns I have uploaded today. Number 73 and number 63. There's a pea<b>rooster</b> in the n.73 rosette! And it's not written Abdo Nahat and sons, for the first time. The label inside was identical to the others brazilians Elias' instruments. Were there some other pea<b>rooster</b>s rosettes in the Sirian ouds from the Nahats or was it a brazilian special edition?? I'm curious to hear your aswer! I meant pavão, the bird. Why did the editor erased the word in English? Is it because...??? OMG, I can't believe it.......! p.s. Pavão that's the name of the bird in portuguese (also means someone who likes to be in the spot, an exhibitionist). Number 35 rosette is even worst to translate. Hope u help me when I upload it ! Were there some other "peeacoock" rosettes in the Syrian ouds from the Nahats, or was it a Brazilian special edition ?? I'm curious to hear your answer ! Thanks Livia, really great shots. I made a special folder in my ouds album & called it "Livia Nahat in Brazil" where I save your special photos of The Nahat Legacy in Sao Paulo . WOW !! I can't recall I've ever seen a peeacoock 's (Arabic : Tawoos طاووس no connotation whatsoever ) rosette like this, neither on Nahat's ouds, nor on other Syrian or Egyptian ouds. It seems like they've liked a well done graphic design & cut it . Though it's pretty nice, I wouldn't have chosen it, since the full uncut parts would block the sound coming out of the soundboard & obstruct the loudness . I shall be tuned to figure out the 35 rosette. There's nothing which is "translation resistant", so worry not . I'm here ! Thanks a million again . Hi, Al Faraby! Two new albuns today! I think these are very special. The first one shows furnitures, Nahat's woody pieces and some studies on wood. In my opinion it's a special legacy. The other one is also very important and interesting for those who love ouds. That are Elias' draws. I felt extremely surprised when I saw all that draws! He was indeed talented. And that are his sketchs of the Cathedral. Very nice. Hope u like it too! Well, I will say "peahen", once the text editor is reproching me I fell like I was in a talk show and the soundman put a "BEEP" ever time I say the name of this naive bird! But for sure it's a male, not a female hehe Just to make things easier. It's sad to hear about the sound quality, but makes sense. There was another طاووس rosette, It's oud number 75. I will upload it soon! Do you have an online oud album collection? Or it's a private one? Any way, I fell honored! This is me who thank u! This is too great to be imagined . There's no way I can express our gratitude, as Nahat junkies, for the unprecedented work of yours, LIVIA ! No one has ever revealed this much info about Nahat's legacy in such a short time like you've done . It was written In the original oud label of Abdo Nahat that they'd make "all oriental crafts" ! It seems they did ! It's amazing though that even though Abdo got famous for his ouds, it had never been written on his label he's a luthier !! The designs of Elias are marvellous. I didn't have enough of them yet, but I shall get back to them later on. 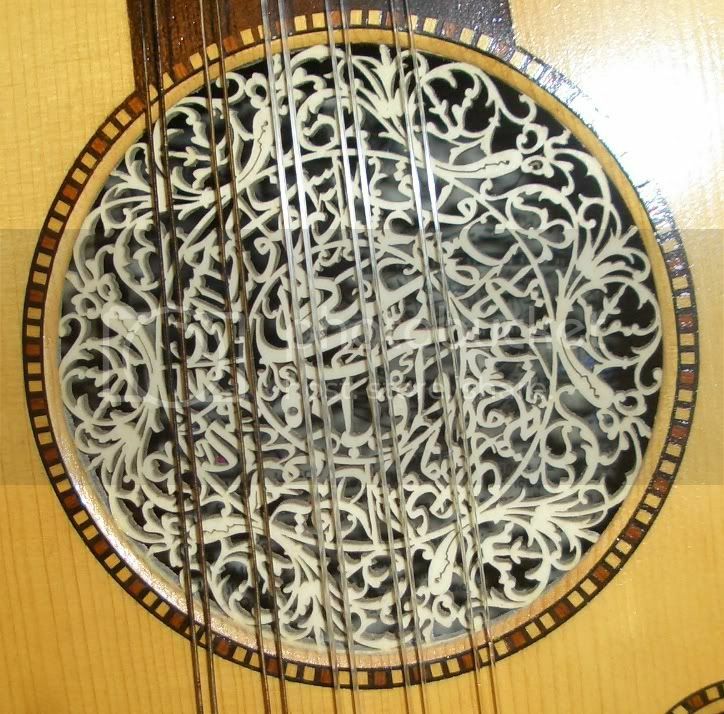 The ornaments aren't totally new for me since we've seen some of them inlaid in some ouds like in these attached old oud built by Abdo & his son Elias, back in 1927. My ouds album is my collection of the great ouds uploaded to this forum & others. Nothing really important to anybody but me , but you're invited to take a look, once you come over to the Holy Land as a pilgrim. You should do so sometime, shouldn't you ? I shall be waiting for more ouds photos. Hey Al faraby! Thank u. I fell blessed to see that my work wasn't in vain! You have no idea how important your comments are! REALLY! Of course I couldn't do everything by myself. Don't forget about it - Nahat's descendents were great in opening their doors and let me photograph everything. And many other people help me - Richard Hankey, Vitor Hiar and now - you. I'm very grateful. I have uploaded two more albuns today. Please, take a look and tell me your opinion. The other طاووس rosette I have told you. And I ask you to see oud number 94. Haven't Elias carved the number 1988 in the rosette??? But the year written in the label is 1984! May be he had to change the rosette and put this new one in 1988?? "all oriental crafts" YES. May be that's why they could survive in Brazil and earn money, as many other arabs who arrived by that time. For sure brazilians were able to recognize Nahat's talent with woods and furniture and of course, their wokholic way of life. And may be Nahats felt fine when they first see our woods. Fantastic woods. Many of them are threatened nowadays. Jamel, my grandpa (the brazilian one, not the lebanese) also worked with woods (to build furniture, houses and mainly big ships) in the amazon area. That's another reason that makes me love Elias' work! They are masterpieces! Being honest, I have no idea about how they sound like.... I wish I could play them to know! If Elias built tablas, I could say something. "once you come over to the Holy Land as a pilgrim. You should do so sometime, shouldn't you ?" Well, I hope so, of course. But when? I have no idea! The farthest I could reach was Turkey. Thank me ? Don't mention it at all, please. We have done nothing, compared to your great job, here & in altarab site. I've seen them all for now ! It seems that Elias has invested more in making the rosettes, than in the bawl . I haven't seen any special woods from Brazil yet . Had he ever used Jacaranda, for instance, in a real unique bawl ? Any how, they're masterpieces, each and every one of them. From looking at the sketches made by Usta Elias Nahat for the Orthodox Cathedral in Sau Paulo, it seems that the late luthier wasn't only a luthier, but also an architect, a graphic designer & a talented Arabic calligrapher. We always thought it was only Mohammad Fadel who designed & "wrote" his own rosette. Now we know that Elias stood behind all his rosettes designs as-well . In no. 94 oud rosette, the year is 1977 & not 1988, so the mystery is figured out now, I guess. He had this 1977 rose model, but it was only in 1984 when he decided to cut & use it ! A guess though ! Suggestion : why not upload a sound file for each oud ? It's the sound that matters after all, doesn't it ? As to the match tomorrow, we'll all hope for a Brazilian knock out, like we've been used to in the old times. For now it's not happening, despite the victories. Well, I don't know . Maybe this time it shall happen. So, good luck. Pilgrimage ? Two more steps from Turkey, and you'd be here. Welcome anytime ! Of course we are so fortunate , because this way everybody is having an original Nahat! PellMellow , it's very rare here in Brazil. Generally the arab's descendents throw everything away, all their old parents legacies. This is a miracle! I have uploaded two new albuns. Oud number 99 is almost the last. The family estimates he had built 100. Isn't it beautiful? I can't recognize all the woods, although my grandpa worked with this (he died when I was 1 year old). I wish my mother were with me in São Paulo. She would know the name of the woods, or at least part of. I guess number 40 is a Jacarandá instrument, I mean, it looks like. You will see soon. The number 80 (I have uploaded today) was made in a dark wood, but surely it's not a jacaranda. It's probably caviúna, which is very used in musical instruments (as cavaquinhos, guitars, and so on). I would like to know if he used brazilian cedar.... this wood was easy to find here until 1980's. BINGO! You really solved the 1977's rosette's mistery! Can you help me in translating oud number 99? I will post a large pic here. Can you help me in translating oud number 99 ? Neither do I ! What a shame ! 99 rosette in altarab site is not actually readable, but I can guess it contains names of Arab & more musical maqams. Get me a bigger & clearer shot & I'll figure it out. I'm uploading a larger picture of 99's rosette. Can you read it?? Can you read it ?? Yes I can ! Not because I'm a genius (God forbids) or so, but because I've seen this rosette before ! As I've guessed , this is a maqamat rose, the same as the attached Abdo's from 1905 . I may dare & make a hunch : Elias, being an Arabic calligrapher himself as aforesaid, renovated his dad's rose and made a nice replica of, like I have done myself once upon a time (attached) & gave it to Jamil Khalaf & Abu Alaa` as a present, but they hesitated a lot & didn't make a rose out of it. Well, yet !! Still Abdo's much more beautiful & authentic than Elias's & mine. So here we go : "Asfahan, ushaq, rahawi, rast, hoseini, bosalik, hijaz, zarkolah, iraq, nawa, bazrak, bayati, zarafakand (a rhythm maybe ?? )..." & maybe some more. Thank you very much for presenting your family's legacy here. It is VERY much appreciated. I have been watching closely and enjoying see the Nahat legacy brought to light after so long. For years I wondered about where the Nahats ended up, and what happened to the artwork of the famous family. My own work has been greatly influenced by your ancestors, and I continuously find inspiration in their work. I was thrilled to see the sketches and drawings that you uploaded, in addition to the inlay sample boards prepared by Elias. Simply fantastic. I have spent many hours creating inlays and patterns based on Nahat designs, and its so nice to see how they developed the patterns. 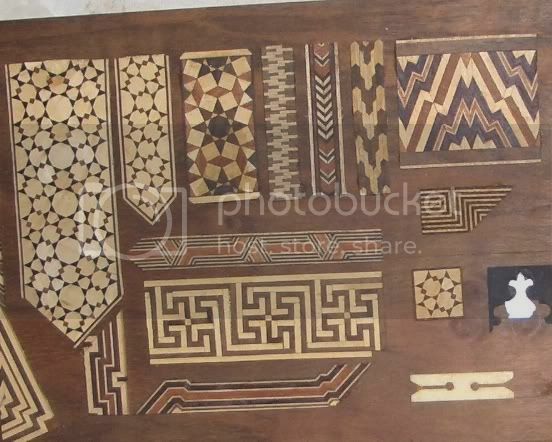 If possible, I'd love to see a hi-res image of the pattern boards if possible in order to learn more about how they are made. One pattern in particular I'm very interested in is the highlighted one in this picture. I've deconstructed this pattern (see my other attachment) and figured out the various elements, but have yet to make it. Thanks again for your efforts. The Nahat family is awe-inspiring. I succeeded this time also ! Thank you very much for presenting your family's legacy here. Hi, Jameel. Oh, no, dear, I'm not from Nahat's family. Please, don't say that anymore. The Nahat could be afraid of me forever hehehe I'm just a researcher and thanks to Dr Oud, I could find Elias'descendents. I will post this pattern in a best resolution, as you asked me. Hahaha Maybe Al Faraby is what brazilians call "cold feet", in portuguese - pé frio. This expression is generally used to someone who gives no luck to the team. Just like Mick Jagger. I guess he cheered for Argentina just to see brazilian a little bit "less sad". Thank u sooooooooo much! How interesting it is! I will upload your translation and of course, this pictures you have sent me (I will not forget to put your name there, ok?) ! Dear, I uploaded everything today. Yes, Nahat's albuns are finally completed! You can see the brazilian label + ouds numbers 35, 40 and 68. And a surprise - A qanoon. Yes, this instrument was probably manufactured by Elias. I could'n see the label very well, so it was impossible for me to say the year and a number serie.... Hope u may forgive this miss. Al faraby, I have no idea abou what zarafakand is. May be it's Zarfand 11/4 (sounds like a rythm of turkish origins)?? I'm crazy about rhythms. This web site was the discovery of the week! Thanks to you Al Faraby (indirectly, I know, but I was looking for this rhythm to show you and I find that fabulous website)! This journey should continue untill you manage to bring us more info. & photos of Elias Nahat. Call, write, sms, beep & don't let go of Simone & others untill they supply the needed. It's NOT theirs anymore . As to oud no. 35, it's quite the same rose with the Arabic maqamat names (& maybe rhythms). It's a real beauty. The Qanoun is the real surprise. This is the first time ever anyone here sees a Nahat Qanoun ! WOW ! The roses are quite the same as in ouds, a masterpiece itself. I wish we could hear its sound ! What a mistery ! Thanks Livia again & again for what you've done here & in Altarab site ! My misunderstanding Livia. Thank you again for all your efforts. Oh, and thank you for offering to post the images in higher resolution. MUCH appreciated. Hi, Alfaraby! You are very kind! Thank u. Well, I will try to do my best. If I manage to receive more stuffs, for sure I will share with you. I wish I could contact the other Nahats. Just this Elias'daughter let me see her personal collection. I have sent them a SMS (cell phone) yesterday, but no aswer yet. I will phone them tomorrow and see if they can send me a picture of Elias and his brothers. That would be great! I knew the qanoon would surprise you. That's my final gift hehe I wish I could hear the sound also, dear. Unfortunatelly, there aren't many anoon's players here. Jameel: never mind! Misunderstandings happens. I saw your ouds. WOW, they are incredibly beautiful! And have a lovely sound, very great work. Well, I am publishing the picture you asked me, ok? The pattern. In a high resolution. I wish this may be usefull to your work. I Thank u all for beeing so nice, this was very important to me. And hope you to keep your gratitute to Elias, his work and, of course, his family generosity.